We spoke to a prospective client who was confused why his advertising on Yelp had yielded no clients, although Yelp’s reporting indicated a reasonable, steady flow of leads. Its commonplace for directories to stretch the concept of a “lead” in order to make themselves look as useful as possible. I get it. We all get it. 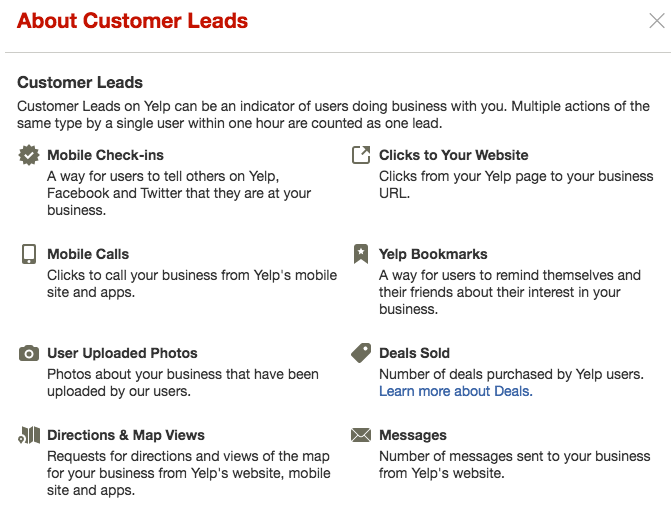 But if you look at exactly what Yelp is considers within their definition of a “lead” it just starts to feel, well, a little grossly overstated. Now, I’d certain recognize calls, messages and sales as “leads”, but most others don’t even fall into my most generous concept of a lead. Website traffic…. can you imagine Google suggesting all of your SEO traffic was a lead? How about uploaded photos? Any reason a diner in a restaurant uploading a shot of his spaghetti and meatballs should count as a “lead” for that restaurant? And I’m not suggesting that some of activities aren’t helpful – looking at your location on a map, for example – but it’s a hell of a stretch to consider them new business opportunities. In the legal realm, presumably if someone is looking up directions, they area bit warmer than just a lead – and its certainly difficult to attribute that prospective client as a Yelp lead. So, I’m picking on Yelp here…. but remember the bigger picture is the importance of not trusting your vendors to tell you how well they are doing. Understand – that for law firms, the definition of a lead is someone who contacts you with a prospective matter. Everything else is just noise – noise frequently generated be vendors to camouflage the silence of your phone. I’ve always been incredibly skeptical of Yelp as a source of business for attorneys, for a whole host of reasons, but this cements my opinion of that. There are at least 2 of these categories of “leads” which are anything but 1) the people who need directions to your location – they have already decided to go, which means that the work was done before they got on Yelp and 2) photos – if they are already there to take a pictures, Yelp didn’t do anything. Never heard anyone say that they loved Yelp, but they do call and call and call ….. I have found that my Yelp website clicks don’t match up with my Google Analytics. Yelp is almost always a little higher than Google’s stats. In the past, I believe Yelp broke down Mobile vs. Desktop web leads, but now they don’t, so I can’t even try and match that to my Google Analytics to see if perhaps the Yelp stats are right, but maybe the site loads slowly on certain devices and I’m losing users before they register on Google. But I’ve also noticed that some days I have MORE Yelp leads in my Google Analytics than Yelp shows, so I can’t figure it out. Has anyone had this problem with Yelp stats for web clicks not matching Google Analytics?